In 2012 I moved from Raleigh, North Carolina to San Francisco. In a lot of ways, the move was an amazing one for my Untappd account. I suddenly had easy access to amazing breweries like Russian River, 21st Amendment, and Rare Barrel. However, I lost access to some of my favorite hometown breweries, as well as a few bigger names I didn’t realize were going to be hard to find in my new hometown, namely Founders and Bells. I’ve been in love with the IPA lineup from both breweries since the first sip, and would hoard Founder’s Double Trouble every February as if I would never be able to buy another beer. Recently, both Founders and Bells have started distributing in the Bay Area. 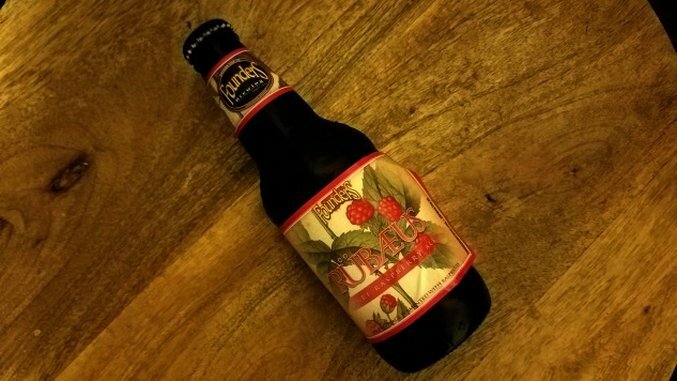 During a recent trip to a bottle shop in Mountain View I came across a single four-pack of Rubaeus, Founder’s Raspberry Ale, and immediately snatched it off the shelf before anyone else had a chance to. I’m not traditionally a huge fruit beer fan. I’ve gotten super into goses this summer, and definitely love fruit-based sours. As far as other beer styles though, fruit beers are typically a hard pass for me…except for this one. Founders sells this one year round, but I think it makes for the perfect beer to drink right around this time of year when you’re not quuuuite ready to give up on summer beers just yet, but you’re not really ready to transition into stouts either. I honestly thought it was a seasonal until I checked out Founder’s site. This is the perfect season for it, and I can’t recall ever drinking any other time of year. Looking at the bottle, you might think you’re in for a fruit bomb, and you are, but not quite in the way you might expect. The ale is sweet and tart, but not so much so that you mistake it for a sour. Instead, malt helps balance it into something very, very drinkable. It’s syrupy almost, but not so sweet it’s overpoweringly so. Founders adds fresh raspberries at five different stages of brewing this one, and you can tell. It tastes like fresh fruit. The brew is lightly carbonated, giving it more of the mouthfeel of a stout or brown ale, making it a smooth, wonderful nightcap, or a delicious mid-day treat. If you’re looking for something to get you ready for fall without totally leaving behind the taste of summer, give this one a try. If you do, be sure to save me a bottle.